Before I start telling you guys my story about how Hurricane Harvey affected me and my family, I wanted to say that we were extremely lucky and that a lot a lot of people got it a lot worse than us. Compared to others, we really didn't loose a lot and the damage after wasn't as bad as other stories that I have heard or seen on the news. Please keep every one affected in your thoughts and prayers. Not just the ones affected by Harvey, but by Hurricane Irma, and Hurricane Maria. So It all started the morning of Sunday, August 26th. I had woken up and it was raining like crazy. I went into the living room, and saw my parents watching CNN. My dad looked at me and said "The street is flooded like last year". 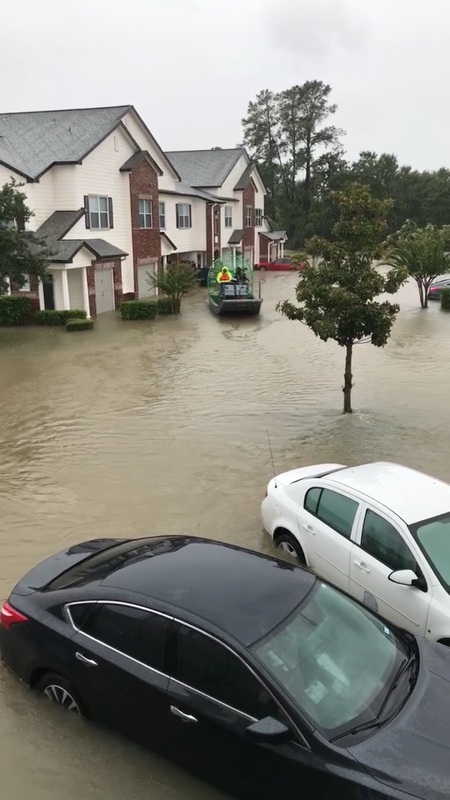 So, last year we had this weird 12hr period of just raining non stop which made our whole street flood like crazy, but luckily our apartment complex was on a hill so we just got surrounded by water, but nothing inside the complex. So I thought that we would be fine since we were last year. Every hour, my dad and I would go check out the front gates to see how high the water was getting and it seemed to go up and up. We were a little worried but not too much since it would rain, stop, and then start going up again. We thought that it would just stay as it was, and since the water had a current, we thought that it would just keep flowing. Around 4pm, my dad went to take a quick nap, and when he woke up around 6pm, we went to go check the gates, and the water was rising rapidly, the creek in the back had come into the back part of the complex, and many of the people inside the complex, had started to move their cars away from the back of the complex. And that is when the panic started to kick in. Long story short, we were rescued by airboat, and after that we stayed with family friends. We lost some of our furniture, some beds, and other things, but besides that we are all okay. Now we are dealing with the crisis in Puerto Rico. My whole family is over there, and if you have seen my vlogs, you know how happy being in Puerto Rico makes me. I am heartbroken by all of the resent events, but I cant wait to go back to normal. I miss blogging and making videos. I will be back sooner that you all think so bare with me! PS: I will be filming a video with the full story on my Youtube Channel soon. "When you go through deep waters, I will be with you". - Isaiah 43:2.